Fall EDT Application Submission Period Now Open! Fall EDT applications will be accepted until November 15. Remember to submit your Professional or Personal development course applications that begin between September 1 – December 31 for funding! Go to www.mrustaff.ca/applyedt for more information. Our MRSA PD Day at the Calgary Zoo was amazing! 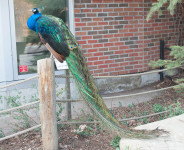 MRU staff enjoyed a wonderful PD Day held at the Calgary Zoo this year. Check out the June MRSAY! Newsletter for photos! Our lounge was adorned by lovely Christmas plants, but alas, it is time they go to some good homes for the holiday season. Congratulations to Lindsay Leahul, Lanny Anderson, Lauren Denney, Chad Miller, Stacey Smith and Eileen Clarke, our lucky winners! Winter EDT applications are now being accepted! 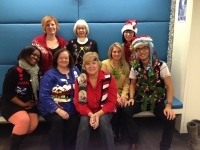 Accessibility Services is getting into the holiday spirit! How about you? The MRSA AGM took place on Wednesday, November 26, 2014 from 11:30-1 pm in the Lincoln Park Room. The 2014 financial audit was discussed as well, there was a presentation from the Negotiations Team. Thanks to all those who attended. Monster Bash – A Success! Thanks to everyone who was involved with making Monster Bash such a success! 250 people enjoyed chili, buns, pumpkin pie, ice cream and Pepsi products. The costumes were fabulous and the entertainment value was priceless! Congrats to Kim Marchand for being the lucky 50/50 prize winner! MRSA “Skeleton Crew”.